‘Awl-love’, Stuart Gurden, Peacock Visual Arts, Aberdeen, 19 August – 23 September 2006.
Review first published, ‘MAP Magazine’, Issue 8, Winter 2006/2007. This is the latest in a line of engaging multimedia productions curated by Peacock Visual Arts, this time in partnership with Scottish Sculpture Workshop’s residency programme. Gurden follows up his 2005 stint at the Workshop with a new video based on a 1000-mile road trip through Aberdeenshire, on which he collected footage of the 41 stone circles in the region visited by Julian Cope when compiling his 1998 book The Modern Antiquarian. 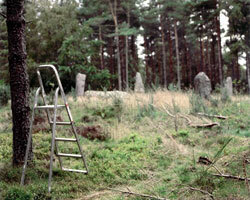 Cope’s extraordinary tome comprises images and commentary on more than 300 stone circle sites around the UK. One critic applauded its comprehensiveness and its ‘fine balance between the academic and the personal and the poetic’. In a similar alchemy, Gurden presents a blend of seriousness, obsessiveness and poetry. An extra Gurdenesque element is added to the mortar via the video. It is infused with an audio-visual psychedelia which trips out the viewer, unsettling what might have otherwise been a straightforward experience: a fan’s affected pseudo-subculture pilgrimage to his idol’s sites of pilgrimage. Sharp cuts in the edit, strobe effects, accelerated frames, upside-down imagery, woozy music and droney commentary add up to a freak-out as the beholder tries to keep pace with Gurden’s obsessive touring. Coming down from the trip of the hard-to watch video, the confused viewer teeters back through the exhibition space. Among the supporting material at its centre – which includes works from and related to Gurden’s 2005 Collective Gallery exhibition Ripples on You – the disorientated beholder encounters a small 2006 drawing, and now a critical theme begins to form in the conceptual haze. A photo-realist graphite portrait of Richard Dawkins is ‘peeled back’ to reveal another such portrait of the ethologist, only this time, strangely, he is a few years his own junior. Dawkins, that noble deflator of gassy religious puffery, in abstract Baudrillardian terms, signifies nothing but his own image. Somehow that composition fits the aetheistic ‘brights’ movement championed by Dawkins. Gurden suggests that we men will know the extent of it all; there’s no supernatural essence behind our own various visions, vestiges or visages. This sort of artful tautology throws a line to the video. Gurden’s superficial then distorted partial repeat of a journey already done – its pointlessness as a scientistic contribution to knowledge – harmonises with Dawkins’s antimetaphysical double image. Part homage to Cope, yes, part foray into new media, yes, but more than anything else, the video coupled with the drawing presents a homage to the right of the artist to – in Nietzsche’s terms for a world not in need of god – ‘bring meaning to the earth’, meaning which despite its often dizzying obscurity is forever a crucial complement to the clarity of contributions from thinkers like Dawkins. Why? Because Dawkins, despite his perspicacity and important assault on faith-based religion, needs the artist and the philosopher, and probably the obsessive (secular) psychedelic, to tackle the question not of how it works, but why there is anything at all. Gurden’s artistic answer is not an answer but a vital antidote to its absence.